BEVERLY HILLS, January 07, (THEWILL) – Garba Shehu, senior special assistant to President Muhammadu Buhari on media, has declared that the President will not support Adekunle Akinlade, preferred governorship candidate of Ibikunle Amosun, governor of Ogun state. Shehu said this in a statement released after the visit of Amosun and Akinlade to the presidential villa on Sunday. 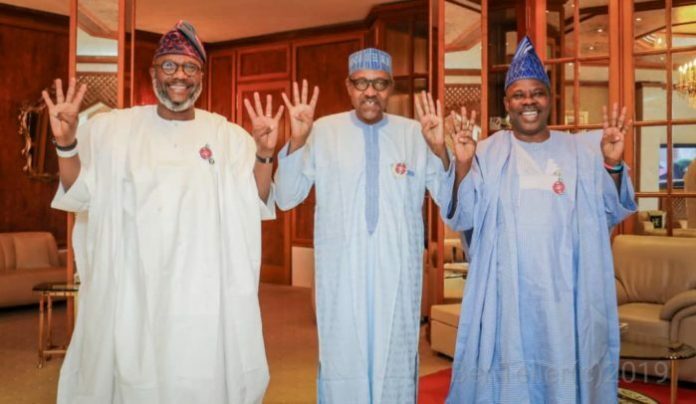 THEWILL recalls that Akinlade could not secure the governorship ticket of the All Progressives Congress (APC) which led to the falling out of Amosun and Adams Oshiomhole, National Chairman of the party. Prior to Sunday’s visit, the duo had earlier met with the president alongside Yusuf Dantalle, chairman of Allied Peoples Movement (APM). During that meeting, the APM chairman had presented a letter to the president from his party, endorsing him as their presidential candidate. But Shehu said Buhari, as leader of the ruling party, would only support a candidate of the APC. “Following repeated media enquiries on the matter, the presidency wishes to state in clear and unmistakable terms that as a party leader and a candidate on the platform of the All Progressives Congress (APC) in the coming elections, President Muhammadu Buhari will campaign for the party and all its candidates,” the spokesman said. He added that Buhari would not decline support from citizens including candidates flying the flags of other parties.